Upon hearing that we were in store for another AR-driven experience, a part of me resisted the idea; which part exactly, I'm not sure, but I guess there's some bitterness over past experiences I didn't even know existed. With all due respect to titles that have pulled this off, it was only after witnessing The Hidden's unsettling execution that I became extra cautious about how this functionality would be used in the future. Consequently, it was as if I was already put off by the very notion of another team using AR as a footstool towards something original. To add to the issue, bad memories still linger over the eShop's most recent RPG, Planet Crashers, and how lousy it turned out to be. I didn't rationalize that the formula of "RPG" and "AR" would equal "disaster," strictly based on my experience with those two games. But it's interesting that despite being conceptually and stylistically different from that of The Hidden and Planet Crashers, Genius Sonority's production makes both titles look trashy by comparison. 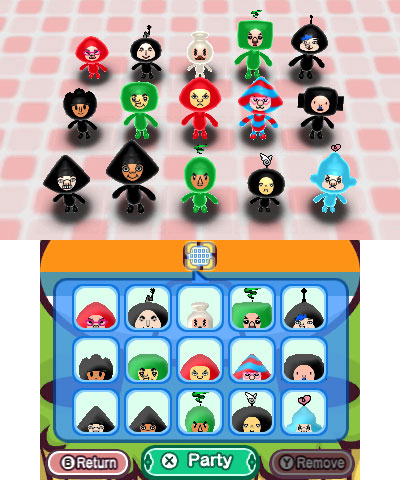 Bigger than that, though, the game time and again feels like a great expansion to Nintendo's own Find Mii, and so, whether just on that merit or on the strength of its own set of features, THE "DENPA" MEN: They Came By Wave is sure to become a new eShop favourite for many. 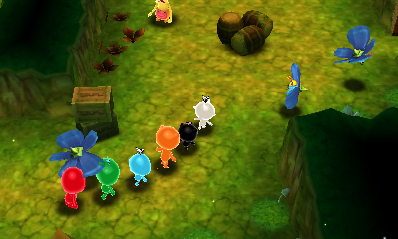 Coming in all shapes and sizes, Denpa Men are excitable creatures with a very Pikmin-meets-Elebits likeness. You will enlist and create your own team of helpers to aid a gentlemen by the name of Herbert, who has made it his personal mission to defeat The King of Evil (how long did it take to think that one up?) and rescue his love interest. The game's setting is that of Digitoll, a central base where radio waves flow in like an airport control tower, and players will have to tap into these streams to gather members needed for the long road ahead. This is where the AR functionality comes in. 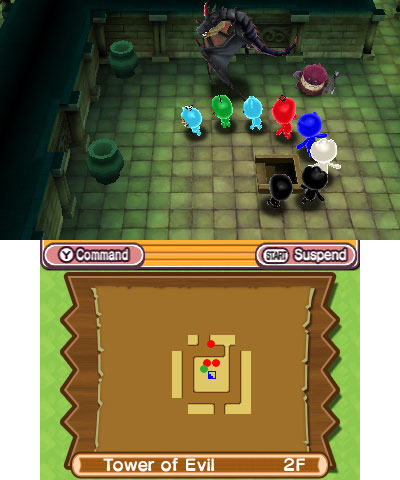 Using the 3DS' front camera, you'll move your system around in real-world locations in search of the Denpa Men. To allow for lighting discomfort or just a plain insensitivity to the whole idea of this method of navigation, players who may be more reserved can actually keep this as a strictly virtual simulation by pressing the X Button, giving the space a patterned background that is uninfluenced by real-world images. It's great to see that the system itself isn't terribly finicky and is fairly simple to manipulate. Once your cursor lines up with one of the floating entities, the X Button will launch a net in its direction. If it misses, he or she will scurry off in an opposing direction, and seeing as there's a finite time to work with before they disappear from sight, it's important that when there are plenty of Denpa Men present that you focus on the ones that will benefit you the most. Those with an antenna come with an upgradable skill, while those that don't -- the more common set of Denpa Men -- have but a basic attack. It can get annoying when they hide beneath your center point, as this forces you to re-adjust by moving the 3DS upwards quickly, just so they can be at a more reachable level. But aside from that, there are no major technical faults to speak of. Of course realizing that this may vary depending on the signals coming through in your area that the game can read from, it's also pleasing to see that, unlike The Hidden, THE "DENPA" MEN won't force you into uncomfortable scenarios or a frequent change of surroundings just to make any kind of advancement. It was perfectly doable in my case to beat the game without ever having to leave home, and for those that may not be as receptive to the idea of looking like a lunatic in the middle of an open field, that may be just what you want to hear. Returning to that earlier remark about THE "DENPA" MEN's connection to Nintendo's own mini-RPG (built into the StreetPass Mii Plaza), what you have here is the role of StreetPass for the ingathering of helpers being replaced with augmented reality as the acquirement method. There's a similar imposition of work involved but also more controllable circumstances in return. When it comes to features such as these being used as a basis for an entire campaign, I'm sure you'd agree that balance becomes especially crucial. Go overboard with how much the game relies on the system and it becomes a gimmick; or worse, it overrides the entire "game" component and turns what should be fun into an extended errand. On the other hand, if this is touted as a selling feature but is in actual fact treated as a disposable part of the picture, such a weak-handed approach wouldn't speak very positively to the overall concept. So, then, where does THE "DENPA" MEN fall? Well, I'm happy to report that the game's use of AR in line with the concept feels just right. It doesn't get caught up in the technical aspects, nor is it tripped up by them. And rather than presumptuously spilling over into the core gameplay to create a point of distraction, the developers have wisely kept the AR usage in its proper place as a sort of contour line to push but not take hold of the entire experience. It would be easy to, from this point on, have the actual RPG component behave with a flat progression, but in a number of ways and through a series of observably good design points and setups, THE "DENPA" MEN elevates itself above that of your ordinary RPG. I probably didn't get this review off on the best note by making comparisons to start with, and to be fair, you'll probably make your own set of comparisons should you decide to take the plunge. But underneath that veil of familiarity tied to its cast of characters, their properties, and the overall spirit, THE "DENPA" MEN is trying to emerge as a somewhat unusual creation. 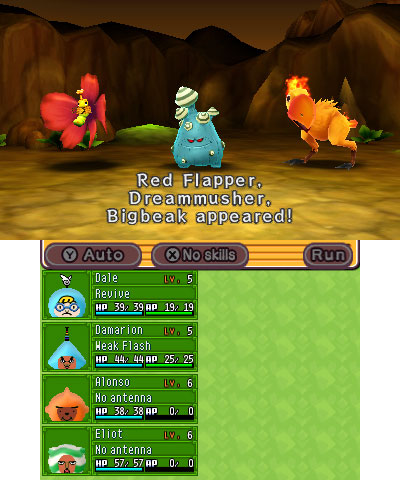 Reasons for initial comparison will likely stem from the game's quirky spirit, and the regularity with which it reminds players of its very existence. The most reliable manifestation lies within the dialogue coming from the otherwise speechless figures you control. When they're not expressing appreciation, the Denpa Men will try to guilt trip you for some apparent neglect, draw attention to your micromanagement, question the intentions of your actions, and even poke fun at the game itself. These comments aren't as repetitive as you might expect and they do vary enough and are treated with enough balance that they don't become annoying. Further to that, the speech carried on by the residents of Digitoll is humorous at times. Talk like this. No form eloquent sentence. Funny, they think they are. And then you have the enemies, which not only have interesting get-ups, but also come in a commendable variety that differ per location. With ferocious mammoths, Chocobo-like bird creatures, to even non-animal entities like corn and teeth serving as a base model for these designs, a bit of creativity has been explored, but again, this is within the confines of the familiar lines they've effectively traced out for this project. Giving its own, more accurate definition of what a party should consist of in an RPG, one other noteworthy thing THE "DENPA" MEN allows you to do is develop an up-to-eight-person team. Seven carefree, fledgling beings will tag along with the main guy, Herbert, into dungeons that are usually laid out in interesting ways, with looks that by no means have great detail to them but are still pleasing for what they are. While touring these different locations, not only do you have multiple paths to explore, but there are also secret rooms to discover, holes that lead to basement floors, warp points to mark progress, treasure chests to track down, and one-time-use restoration pools. In like fashion, the game also brands its teamwork approach by determining that progress should be measured by universal experience points. Rather than doling out individual EXP per character, the game keeps it simple by having only one number at the conclusion of each battle that all active team members can benefit from. To ensure that you get an informed look at the Denpa Men race, each world that you visit will present enemies and bosses that have specific elemental weaknesses. With the exception of the black Denpa Men (neutral), all others have colours reflecting, not the attribute that defines their attacks, but the one that they have a resistance to. Supplementing this diversity with an individualized approach, the game tries to make it so that you feel connected to the individuals you've chosen to represent your team (which, rest assured, will undergo changes on the regular). Just to keep things interesting, those with special skills aren't necessarily superior to those who only rely on the headbutt move standard to all, as it is the varied stat listings and additional items you choose to equip that will ultimately determine who is best-suited for the task at hand. Equipment can be found either in chests on the adventure field, given to you as random gifts when capturing Denpa Men, or purchased from the shop. Though you may not realize it initially due to the unlock system put in place, the item selection is quite broad, surprising to say. Even more surprising is that the prices adopted by the shop are not set in stone and fluctuate depending on the current world and the kind of monsters to be found there. So all in all, whether looking at organization or focusing on the dungeon-crawling side of things, some good ideas have been explored, albeit they are nothing overly unique. The only remaining point of possible disconnect is the battle system, and seeing as it's an area where everything could easily fall apart, there is reason to be thankful for it holding up as adequately as it does. Engagement principles include first- and surprise-attack phases, offensive effects include that of critical hits and status inflictions, and there are also two selections put in place to suggest an autonomously-led system. All of the above can be seen as pretty common approaches for the genre, so aside from the lack of a single defensive option (which is an observation, not a flaw), there's really only one area where the battle system really does something that's a bit different, and that has to do with the sequencing of events. Really, there's no lasting organization to this, and in a certain respect, the game can be seen as a tad disorderly because of it. Let's say you have a character that's had the misfortune of getting poisoned just as he's running low on health. You may have an Antidote at the ready to cure him of this effect, but it may be that before the time comes for your turn, he or she might succumb to an attack by another enemy. Even when you think you've got a grasp on the turn order for the specific match you're in, you'll find it's not something you can put absolute faith in. This adds a level of anxiety that takes the heat off the game when it comes to being too set on a predictable direction, but at the same time it's not something everyone will like if they're used to more structured role-playing games. 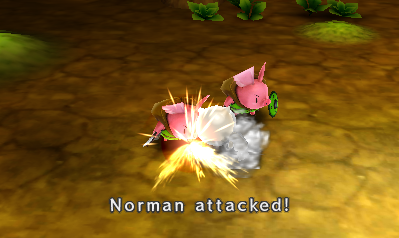 If your team's collective life force is depleted or you leave a dungeon prematurely with some fallen party members, not only could you lose whatever your progress you've made up until that point, but all except for Herbert will be sent back to their original territories to be captured once more. Thankfully they won't take their add-on equipment with them to wherever it is that they disappear to, but it can still be a tough loss at times. Once again recognizing that not everyone will be content with going out of their way to keep things going, a special shrine has been provided to retrieve fallen allies at a cost that varies depending on the level of the person. It really is great that they had the foresight to include this feature. Upon defeating the main threat, players will be given a new task that serves to continue the experience quite nicely, involving the traversal of a few new locations -- an expansion that is preferred over a return tour to places already visited. But just reaching to this point, THE "DENPA" MEN will have already sustained you for around the 20 hours, so with additional time to be spent beyond what is involved in the compulsory quest, that kind of length certainly gives the game the strength and value of a retail release. Just to close off the discussion on presentation, the only spot where I felt 3D benefited the visuals was in the Dark Ruins world, but even then, it doesn't serve as a strong boost to the overall aesthetic. Also, the game's soundtrack doesn't have what I'd call the most memorable batch of tunes. I even felt it was trying too hard in places and came off a bit abrasive because of it. But truth be told, I paid less and less attention to the music as I went along. Because of the almost templated progression and for one or two other reasons, I don't think THE "DENPA" MEN: They Came by Wave will be to the taste of every RPG fan. That said, don't quickly conclude this isn't worth the upgrade from something that has been made available at no cost -- if you choose to look at it that way. Really, those who have found themselves developing an appreciation for Find Mii will be pleased to find similar feelings being nurtured here. But even without the comparisons, THE "DENPA" MEN: They Came by Wave is a well-rounded, approachable RPG that not only delivers on most of its promises, but also supplies a great deal of content to appease anyone longing for a downloadable game they can really sink their teeth into.